When you experience pain in your neck, you want to address the discomfort as soon as possible. The specific treatment solutions that may help with your pain depend on the underlying cause of the discomfort. A thorough chiropractic exam by your Toms River chiropractor at Maximum Wellness Rehabilitation, will identify the causes of the neck pain, and provide a personalized treatment plan to help with the situation. Your neck, also called the cervical spine, begins at the base of the skull and contains seven small vertebrae. On average, the weight of our heads is 12 pounds, and is completely supported by the cervical spine. Because the cervical spine is flexible, and can move your head in nearly every direction, this flexibility makes the neck very susceptible to pain and injury. Dr. Jeffrey Gurrere at Maximum Wellness Rehabilitation, LLC sees patients who have neck pain from a variety of sources. Wrong Position while Sleeping - If the neck is not properly supported while sleeping, a person could wake up with a stiff or sprained neck. Sports Injuries - Those who are trying a new sport, or are taking their involvement to "the next level" may risk neck injuries. Neck injuries such as concussions and stingers can be common. Repetitive Motion – Repetitive motions in activities such as swimming or dancing can result in increased pressure on the neck. Whiplash - Whiplash is caused by the head moving forward suddenly, and then immediately backward. This is a common occurrence for those who have been involved in an auto accident. The soft tissues in the neck become torn or ruptured. It can also lead to muscle sprains, strains or spasms. How Does a Chiropractor Care Help? Your Toms River chiropractor can help with pain relief by addressing the compression or poor alignments in the neck. If your spine does not align properly, it will lead to discomfort. In time, the discomfort can worsen into pain due to the pressure on your head or the gradual increase of pressure on specific points in the neck. At Maximum Wellness Rehabilitation, LLC, we use chiropractic techniques to adjust and reduce the pressure on your spine. This will improve the alignment of the neck and head. We focus on helping your body heal and recover through natural solutions. Dr. Gurrere may also recommend exercises and stretches, as well as ways to improve your posture. These will help you with the healing process. We develop a personalized treatment plan based on the cause of your discomfort and the potential complications associated with the injuries or compression on your neck. We understand seeking chiropractic treatment for discomfort in Toms River or Brick, NJ is a personal decision. However, you should consider treatment immediately after a car accident or any other accident causing personal injury. We also recommend seeking treatment for persistent and chronic problems. 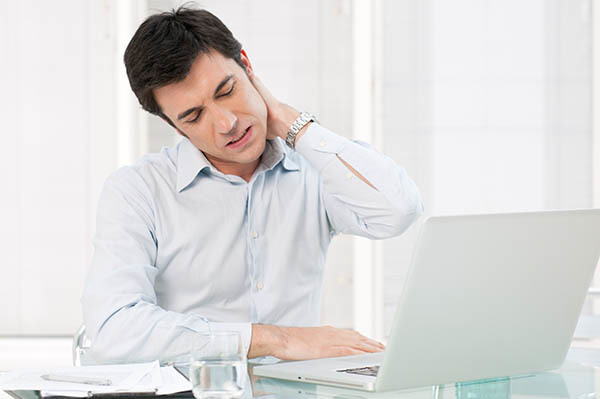 You may want to consider treatment from a chiropractor if you notice discomfort due to sitting for long periods of time at your work or using electronics throughout the day, even if it is only a slight soreness in your muscles, since it may worsen over time. If you are experiencing neck pain or discomfort, please contact Maximum Wellness Rehabilitation, LLC in Toms River today. To schedule an appointment, call us at 732-818-1999.